Top: Target (here, on sale for under $20!) // Jeans: Free People (here) // Booties: Marc Fisher (here available at DSW for under $60) // Earrings: Belk (here, on sale for $15!) // Lipstick: Lipsense Blu-Red (Haley, an awesome independent distributor, is offering 10% off these products to anyone who orders from her and mentions Ashley's Passion for Fashion! Order by direct messaging her on Instagram HERE). I hope everyone is having a WONDERFUL week! This week has been busy with studying for my FNP boards which I will take next month, but I am SO thankful for this time to study. God is good!!! So right now, while I am taking a study break watching my fave show (Big Brother! Anyone else a fan!? ), I wanted to write a blog post to share this #ootd that features one of my favorite new tops! This top I originally blogged about HERE, and is one from the super cute and fashion-forward Who What Wear line available at Target. 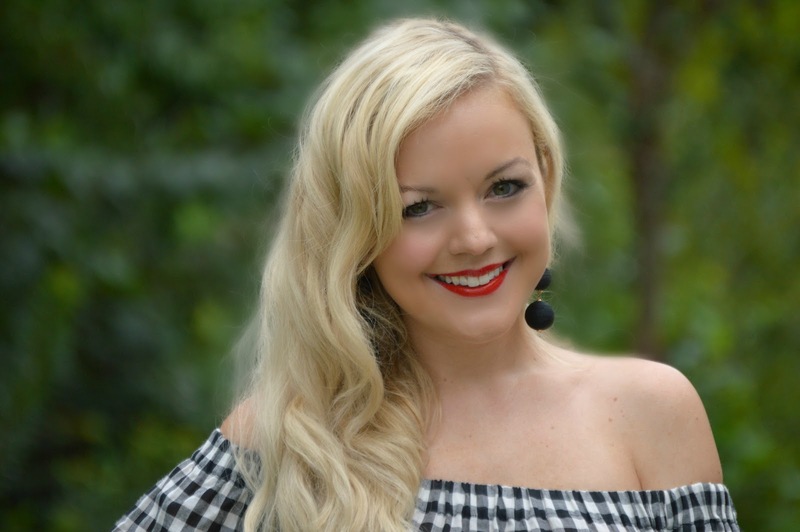 I love this top for MANY reasons....1) it's off the shoulder (OTS) which is one of my favorite styles; 2) I love the bell sleeves which add some flare to a top; 3) it's black & white gingham. Need I say more? 4) It is the perfect fall transition piece: wear it now as I am above, wear it later with some boots, jacket & scarf. I also love the Free People jeans I'm wearing above. They were a new purchase from a super cute little boutique in The Gulch in Nashville. I found the exact pair on Nordstrom's site so I linked it above. I know I will get a lot of use out of them this fall! Also......can't finish this blog post without mentioning how much I am in love with the Marc Fisher booties I'm wearing in this outfit. I originally bought this exact pair in cognac from TJ Maxx, and when I found the black pair from DSW I knew I had to have them...lol. Bonus, they are currently on sale! Who else buys something they like in multiple colors!? Of course you have to top off a black & white look with a bold red lip, right ladies!? This pretty lip color I'm wearing above is by Lipsense in the shade Blu-Red. It LITERALLY lasts all...day...long! I am SO amazed at the quality of this product and how well it lasts (even through a meal!). I am thinking of doing a tutorial + video review on this product, is that something y'all would be interested in!? Send me a message on Instagram here, or e-mail me at ashleyspassionforfashion@gmail.com and let me know! I hope y'all have a wonderful rest of your evening! Thank you SO very much for stopping by, as always!! !